Tony Rodd shot to prominence as a finalist in last years Masterchef. The moustachioed contestant struck a real chord with the audience for his elegant, imaginative food and sartorial elegance. One of the many reasons I don’t tend to do desserts is they require measurement and an accuracy that I simply don’t have the patience for. You will see from the photograph and recipe this is not a skill he lacks. Tony’s introduction on Twitter reads: Cosmonaut, Cook, Magic Man and Office Worker.. I have an idea that the balance is now heavily swayed towards that of cook although I can see the lure of a life as a cosmonaut! I am genuinely thrilled when a chef takes the time and effort to contribute to my blog. Huge thanks to Tony. You can follow him on Twitter @TonyRoddUK. I wish him continued success. If you feel brave enough give this recipe a go! 1. Place the cherry compote and sugar in a blender, blend until smooth. Place in an ice cream maker until thickened. Alternatively place in a plastic container and freeze until firm place in a blender and blend, replace in container and freeze. Repeat to freeze and blend again Freeze until required. 1. Place the chocolate in a bowl over a pan of hot until melted stir gently. 2. Cut 4 strips of acetate measuring 6cm wide x 25cm long. Wrap each into a tube measuring 7cm across and secure each with sticky tape. 3. Place the acetate tubes on a baking sheet covered with non-stick paper. 4. Spoon some chocolate into one tube turn to coat evenly, Place on the baking sheet repeat to make another 3 chocolate tubes. Chill. 4. When set spread a second layer of chocolate over each tube, chill to set. 1. Set the oven to 170C /325F/Gas 3 and place the shelf in the centre. 2. Grease and base line a 17.5 cm round sponge tin with greaseproof paper. 4. Place the mixture in the tin spread evenly and bake in the oven for 20 minutes until springy to touch. Cool in the tin. 5. Turn out of tin remove paper and place on a board using a 6 cm plain cutter cut out 4 circles of sponge. 1. Place the cherries kirsch and sugar in a pan heat gently until tender. 3. Whisk the cream until softly peaks and fold into the cherry mixture until evenly blended. 1. Place the cherries and redcurrant jelly in a saucepan heat gently until the juice runs. 2. Blend the cornflour and water together add to the pan and stir until mixture thickens. 1. Place the sugar and water in a pan heat gently until sugar has dissolved. Boil rapidly until the syrup turns a pale brown .Remove from the heat. 2. Stir in 3/4 of the melted chocolate to form a crumb mixture, place on a baking sheet and cool. 1. Using fresh dry leaves paint the underside of each leaf with 2 layers melted chocolate chilling in-between the layers and using dark, milk and white chocolate. Chill and when set peel the fresh leaves away from the chocolate leaves. 2. Brush the cherries lightly with liquid glucose and cover evenly with flakes of gold leaf. 3. Whip the cream until thick. 1. Using a scalpel slit the tape and carefully remove the acetate from the chocolate cases. Place at one end of each serving plate. 2. Place a chocolate sponge round carefully in the chocolate cases Pipe or spoon the cherry mousse on top of each sponge to within 1 cm from the top. 3. Spoon the cherry sauce on top of each, sprinkle the chocolate soil around the chocolate cases. 4. 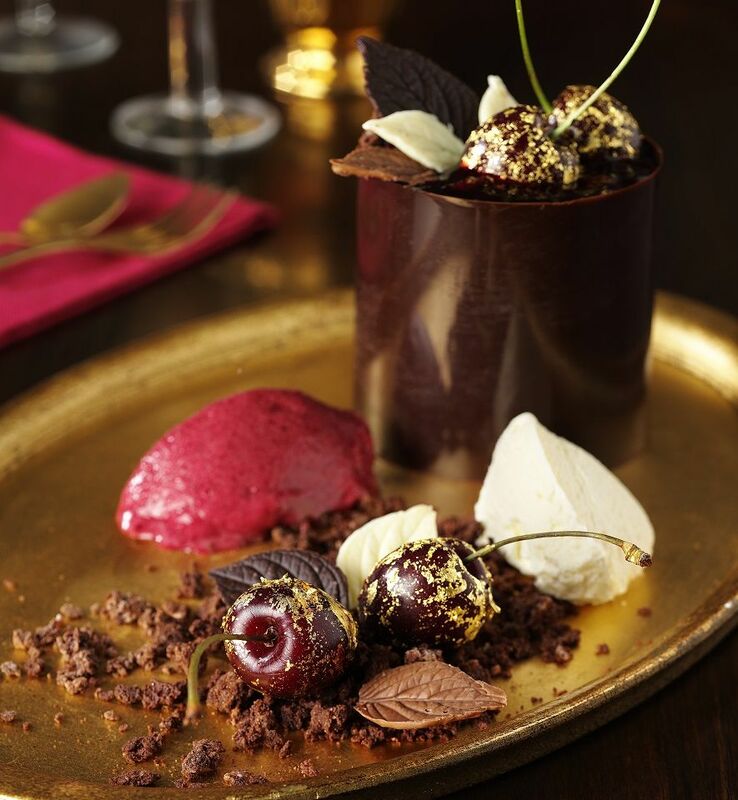 Decorate with mixed chocolate leaves, gold cherries on the desserts and on the plates. 5. Just before serving place a quenelle shaped spoonful of cream and sorbet on each plate.